254304 features: Learning ring. Finger guard. Handle color: Natural. Number of items included: 3. Pieces included: -Chef's knife/peeler. Dimensions: Overall product weight: -0.51 lbs. Le Petit Chef is an educational tool to teach kids how to cook safely. Teaching your kids how to cook is not only educational, but it is a great bonding experience. Recommended for age 7-11. 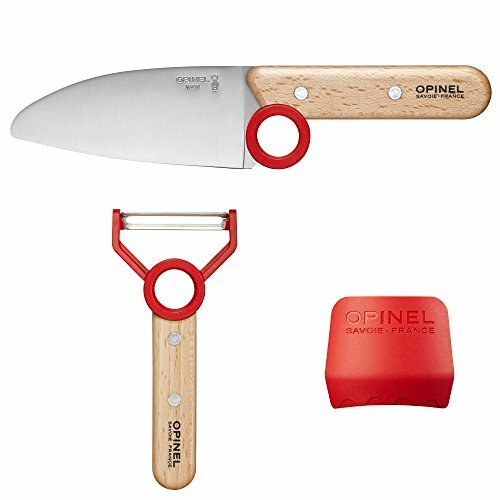 The vegetable peeler is equipped with an educational ring which helps to position fingers for easy peeling. This plastic shield protects the hand that holds the food to be cut: fold your first two fingers into the shield and use the thumb and ring finger to hold the food. The style of the chefs!